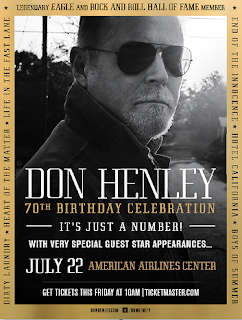 Don Henley was working this weekend as he turned 70. Henley performed his 70th birthday concert in his hometown Dallas and he had lots of special guests. Stevie Nicks recreated their Leather and Lace, Patty Smyth resurrected their 1992 hit Sometimes Love Just Ain’t Enough, Timothy B. Schmit put the original voice into I Can’t Tell You Why and Joe Walsh was there to be … well … Joe Walsh and play Rocky Mountain Way. Walsh will turn 70 this November 20. Timothy B. Schmit will be 70 three weeks before Joe. The late Glenn Frey was a year and a bit younger than Henley. Of the original band Bernie Leadon turned 70 a few days earlier on July 19. Randy Meisner was the oldest. He is now 71. Don Felder, who joined in 1974 for the third album ‘On The Border’, will be 70 in September 2018.